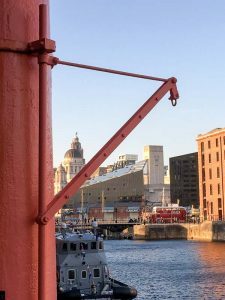 An anniversary visit provided an opportunity to return to Albert Docks, Liverpool. This wasn’t a photography visit Per Se, so I just used my phone and added to the 12 Pics series here. You can see that in some of the images the phones camera was starting to struggle a bit. Perhaps a flagship model would have coped better? On the one hand the images are OK as record shots. On the other, the photographer in me thinks I should have used one of my cameras rather than my smartphone. Nobody pays any attention to people using smartphones to take pictures, but in some places using a ‘big’ camera would have security guards twitching. You cant help thinking if you were doing anything untoward you would blend in better with a phone. Normally I would have brought my Nikon V1 as my travel camera, but for this weekend I left it at home. There could still be an argument for something more capable than a phone but not the size of a DSLR. I hope the race towards full frame mirrorless doesn’t leave a gap in the smaller more portable camera category. The trend at the moment seems to be mirrorless full frame with big expensive lenses. Just when people need a smaller alternative it looks like that option could have less choice in the future.